Editable royalty-free map of Netherlands in vector-graphic online store. 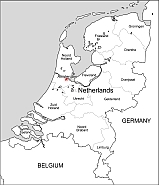 THIS SMALL, DENSELY POPULATED country is also referred to as Holland, the name of two of its provinces. In the 16th and 17th centuries, Dutch merchants and sailors traveled far and wide, trading in gold and spices. The empire they established stretched from Southeast Asia to the Caribbean. 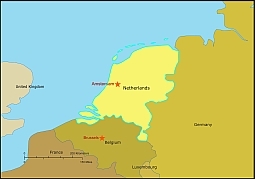 Trade is still of great importance to the Netherlands today, since several large international companies are Dutch, and exports make up about half the country’s income. The Dutch are known for their tolerance and for their liberal social attitudes.